Unbridled ferocity, technical supremacy and relentless aural battery….is there a more succinct description of the greatest thrash metal album of all time? 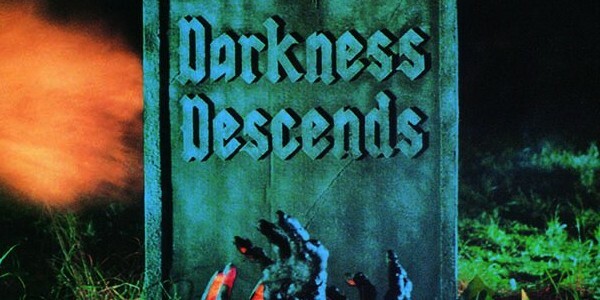 Featuring the likes of the rampaging “Merciless Death”, the incendiary “The Burning Of Sodom” and the progressively minded “Black Prophecies“, the first indication of the 100+ riffs per song and epic song length mentality the band would explore on later releases was writ large on Dark Angel‘s terrifyingly tenacious, genre-defining, debut. The eerie yet elegant bass intro to the aforementioned “Merciless Death” aside, moments of respite were few and far between on Darkness Descends, as Dark Angel focused on thrashing harder, faster and with more gritted teeth malevolence than any other band on the planet…..and that includes the mighty Slayer! This immortal entry in the history of thrash metal has lost absolutely none of its power. Honourable mention: 1991’s Time Does Not Heal is a technical masterclass and deserves every accolade thrown its way! More honourable mentions: Every album you feel should be included and hasn’t been! We acknowledge that no Anthrax (sorry), no Nuclear Assault, no Destruction, no Death Angel, no Overkill, no Sabbat, no Sacred Reich, no Annihilator, no Razor, no Suicidal Tendencies, no Voivod, no Possessed, no Forbidden, no Flotsam and Jetsam and no Heathen etc will upset many of you. And, you’d be right. There’s just too many milestones of thrash to squeeze into one Top 10 list!